Our estates are spread across thousands of acres in and around the Ghats. Situated at high altitudes, and on the fringes of deep forests, they allour estates have stories and secrets to tell. Interestingly, though many of the estates have moved several ownerships, the ethereal essence prevails. We have continued this tradition of preserving this beauty, by ensuring that the people who tend to the estates are those from the region itself. Read on to know more about our estates and their unique stories. History is replete with folklore at Kathlekhan (dark forests in Kannada) estates. The origin of these estates can be traced back to 1832. Owned by the Café Coffee Day group, we make every effort to preserve its pristine beauty amidst the wilderness. It is situated in the Baba Budan range at an altitude of 3000- 3500 feet and is on the periphery of one of the remotest forests. The land is ripe for coffee cultivation. The forests surrounding the estates are home to many wild animals. The estate is rich in bamboo bushes, pepper vines, arecanut trees, rich deciduous trees and beehives lending a bounce to the life in the wilderness. 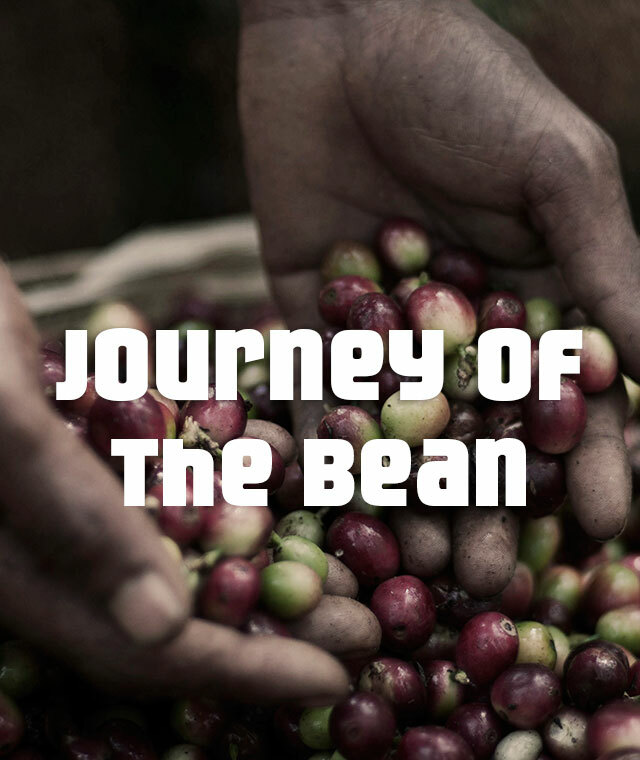 The coffee berries are handpicked by a tribe that specializes in the profession. As we are dependent on the expertise of our berry pickers, their welfare is high on our agenda. The estate runs a school for the children, a hospital and provides free electricity to all the houses. Amidst all this, the charm of a bygone era can still be felt in the form of the preservation of antiquity - an age old natural huge pond, a British bungalow and Columbian pulping machine. The Kathlekhan Estate is also known for growing single origin coffee (coffee procured from beans grown in a single location) which goes by the name of ‘Dark Forest’. Single origin coffees have a uniformity of flavor and richness, one of the parameters of quality. The specialty coffee beans are grown in high altitudes and harvested with precision. No surprises as to why the estate received the award of specialty coffee producer from Coffee Board of India. Situated at an altitude of 2600-3000 feet, Devadarshini estate produces Robusta coffee along with an abundant produce of vanilla. Robusta (harvested mostly in India and Africa) beans, used mostly in instant coffee, are harvested here. The association of the concept of 'divinity' with Devadarshini Estate is profound. Situated near the Bhadra wildlife sanctuary and the river, Devadarshini, as the Kannada word suggests is 'a place where one meets the divine'. The estate draws its name from the temple of Lord Shiva (Hindu God), built in the 12 century AD by Basavanna the spiritual guru of Lingayats. Wild life is vibrant adding life to the land, steeped in age. A quaint statue of Nandi (the bull of Lord Shiva) and a shrine for Goddess Chowdi (the reigning deity of estate workers) contribute to its timelessness. Pepper, oranges, paddy and arecanuts are grown, adding richness to the output of crop. Situated at an elevation of 2500-3600 feet, both Arabica and Robusta beans are grown here. You can also find arecanuts, vanilla, pepper, and oranges growing in and around the estate. The Kudregundi estate has an interesting and picturesque association, steeped in myth and history. The estate takes its name from Kudre the Kannada word for horse and Gundi for pit. The legendary warrior Tipu Sultan was supposed to have triumphantly marched through the deep forest corridors during the second Mysore war, and built a temporary resting fort for his men and horses. The horses that fell in the battle were buried here. According to folklore, one can still hear hoof beats in the quiet stillness of the night. The estate itself comprises four blocks. The Basava temple (dedicated to the Bull, the vehicle of the Hindu Lord Shiva) is located at Kanive block. Prayers are held every year for showers around Ugadi, the New Year’s Day for people in South India. Home to wild boars, deer and different species of birds, especially the mynah (known for its talking abilities) and the peacocks, the estate and forests bustle with life. The Hulige Halla waterfalls are great attractions to visitors. Situated at an elevation of 2400 – 3100 feet, the fertile Halasoor estate is most suited to grow Robusta beans, along with vanilla, pepper and oranges. Known to be one of the oldest British properties near the Bhadra forest, this is now part of our estates. As this a deciduous forest area, it has trees which are more than a hundred years old. Wild animals like wild boar and bison roam around freely, around the Bhadra river and forests. Quite different from its namesake, this one is different on a few key points. Situated at a height of 2600 – 3200 feet, the estate is around 15 kilometers away from the National Highway 48. As it enjoys a very high scale of rainfall, the estate is suited only for Robusta beans, along with arecanut and pepper. Wildlife is abundant with elephants, panthers and bisons seen roaming about freely. The region is vast, with several attractions like the railway line that runs through the mountains, the Ettina waterfalls and a hydro-electric project. Perhaps, it is this combination of man-made and natural creations that makes this place special. Situated at an elevation of 2500- 3900 feet, the Sampige Hutty estate enjoys proximity to the Bhadra wildlife sanctuary. Both the Arabica and Robusta beans grow here, along with arecanut and pepper. Interestingly, the region is abundant with trees belonging to the Ficus family which bears fruits in summer. This naturally poses as a great attraction for birds of the region. Elephants, bisons and panthers are often spotted in the estates. Developed by the legendary British planter, Mr. Hamilton, the region is favorable to grow Arabica beans. The estate is situated at a height of 3000-3500 feet above sea level. The region acquires a certain sanctity due to its proximity to Charmadi ghat (a mountain region that connects to Chikmagalur) and to holy places like Kalasa, Horanaadu and Dharmastala (holy places for Hindu devotees). One of the oldest estates, Girikhan is situated near Attigundi, a pilgrim place around hills. At an altitude of 2600-3000 feet, the estate is home to Arabica and Robusta beans, including an abundance of pepper and arecanut. The estate is rich in water resources, including many picturesque waterfalls dotting the region. Wild boars and panthers roam around, and even bison visit the estate for a night's rest. 'Teertha' in the regional language translates to 'an aesthetic form of water'. With plenty of water bodies around, the area is naturally sound to grow Arabica beans. Besides Arabica beans, Robusta too is cultivated. Vanilla, oranges, pepper and arecanuts are cultivated, adding to the richness of its produce. An amazing variety of forest trees like teak, rosewood and sandalwood thrive because of the richness in the soil. The presence of Shola forest inside the estate adds to its richness. Merthi hills, around the region is a trekker's delight! Interestingly, Coffee Board of India has chosen this estate as a finalist in the specialty coffee plantation category. Positioned at a height ranging from 2500 – 3800 feet, this estate grows Arabica beans around Baba Budan hills, along with arecanuts and pepper. According to history, this was specially founded by Mr White, a European planter, and later passed on to regional groups. Located near the Bhadra wildlife sanctuary, it is a natural locale for spotting wild animals. This estate situated at an altitude of 2600-4200 feet has had several owners from the British to the local planters. Robusta and Arabica beans are grown here along with arecanut and pepper. It is well located around the fringes of the Bhadra wildlife sanctuary, and often, wild animals like elephants and panthers are spotted. The region is famous for rosewood trees; with a history of British ownership, several antique British spray equipment have been preserved. Rajagiri and Sannkhan Estates are sited at an elevation of 3000-4500 feet near Kemmanna Gundi hills, around the Baba Budan region. At such a high altitude, the scenic surroundings are really astounding. The region is best suited for growing Arabica coffee beans and pepper. The estate is steeped in shola forests and exquisite flora. As it is close to the Bhadra wildlife sanctuary, wild animals like the boar, panthers, elephants and a special variety of deer can be spotted. Waterfalls and streams enliven the scenic beauty. The Kemmannagundi hills are among other attractions. Our business sense is made holistic by our commitment to our social responsibilities and conservation principles as well. The plantations are home to a variety of birds and wildlife - hare, deer, bison, elephants, tigers, panthers and boars, to name a few. The estate shares boundaries with forest reserves and wildlife sanctuaries. Conservation of the wildlife in their natural habitat is a matter of pride for us. The Bhadra river, along with seasonal and perennial mountain streams takes care of the plantation’s water requirements, and ensures that the sustenance of the forests is adequately covered. Pepper, cardamom, arecanut, oranges, jackfruit and several herbs and shrubs are native to this region. All these enhance the biodiversity of the forest formed by trees like silver oak, rosewood, candleberry, jamun (tall and evergreen tree, indigenous to India) and others.